Kawahara-cho shopping Street was established back in 1967. 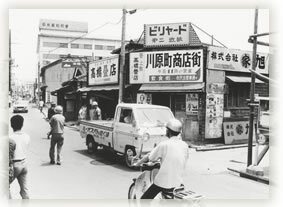 At that time, it was just a small shopping street where some stationery stores and drug stores were running their business. Thereafter, the number of stores gradually increased, and in 2009, it had developed into one of Hirakata’s most popular shopping streets where various restaurants and dinings gathers such as Izakaya, Snack Bar, Lounges, Bars, Clubs, Chinese cuisine, Italian cuisine, Korean cuisine, Japanese cuisine, Yakiniku, Sushi, Yakitori, Kushikatsu and Girls bar…etc. We are very much look forward to seeing the future development further more of Kawara-cho Shopping street from now on! We will run sound business in Kawahara-cho, aiming for safe and lively city planning. In collaboration with police stations and city hall, exchange information such as crime prevention measures in maintaining security. Exchange with local self-government association, Seniors association, children association, etc. Street lights help crime prevention and security maintenance by illuminating the night road which customers always use. There are a variety of stores, which are easy for people to access. Members of store association can get cash discounts such as cable broadcasting, driving agency…etc. We are planning to work on these initiatives above. It is because each member cooperates and the Store Association is functioning that maintaining these benefits and getting cooperative funds. Your cooperation will gradually improve this city. Please join us at the Kawahara-cho Store Association by all means. The Kawahara-cho Store Association declares “eradication of drink-driving”! 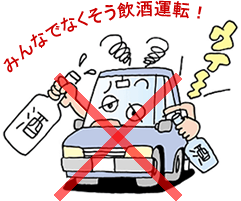 On September 14, Governer of Osaka prefecture declared “eradication of drink-driving”. Death accidents caused by drink-driving are increasing ! Implementation of simultaneous drink-drinking inspection in all Osaka Prefecture and early morning inspection etc. Thorough investigation of three drinking alcohol offenses (offering vehicles, providing alcoholic beverages, passengers). Alcohol check at the time of calling. “Kawahara-cho Shopping Street”, in front of Hirakata-shi station. What kind of impression do you all have in this word? There are a lot of stores which you cannot see the inside of from the street, and then this may cause a slightly inaccessible impression for you, However, there actually are a lot of interesting stores in Kawahara-cho Shopping Street and recently introduced in Hiratsu’s “Show your store” program. Recently, new moves by young shopkeepers are getting more active in this Kawahara-cho Shopping Street. “Bar de Moo” and “Kuroge Wagyu Hirakata” joined it and it gradually became a big movement. And now, “Yama-kura” is responsible for the chairman of the Store Association itself, instead of the Youth Department. As a shopping street, various ideas come out every day and discussed, this time we looked at some of them. Memo written by “Kuroge Wagyu Hirakata” says the idea of what Kawahara-cho should do in order to be “the world’s best shopping street” in 100 years later. 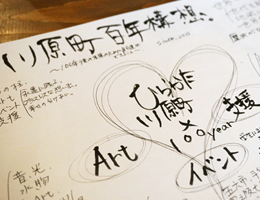 Various ideas are written, such as music event and creating something utilizing the legend of milky way in Hirakata or about using the vacant room in Kawahara-cho as a guest…etc with three pillar of concepts “Art”, “Event” and “Support”. We do not aim for the world’s biggest in terms of size and things, We rather aim to become one as shopping street, focused attention from the world by enhancing the quality of the heart such as people’s interaction. If so, it is not an impossible goal. It is old and new. There have been from old times, but we can find new discoveries in it. It means various new and old stores interwoven and they create an unique taste of the whole city. In the above note, the key words such as “back street” and “hole-in-the-wall” are written, but there are also images of “adult” and “class”. “Old New” is an exactly the perfect expression for Kawahara-cho. Based on this concept, we are planning various events such as art, aiming to be a place for people to interact and to be rooted in the area further.